It’s DC Wine Week all week long! So if you’re in or around the nation’s capital get yourself to one of these events asap – and of course don’t forget to tweet about it under #dcwineweek. We’re still busy in the winery and unable to attend, but were excited to be asked to guest post for the DC Wine Week Blog. Check it out here. Let us know which events were your favorites! 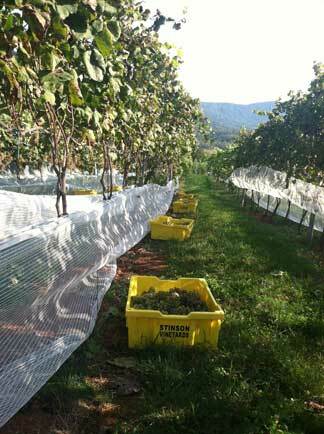 We tucked our Petit Manseng grapes safely into netting once verasion (ripening) began to keep it safe from birds. Last year the mockingbirds had a field day on the fruit, inviting in other birds from who knows where to ravage the grapes. 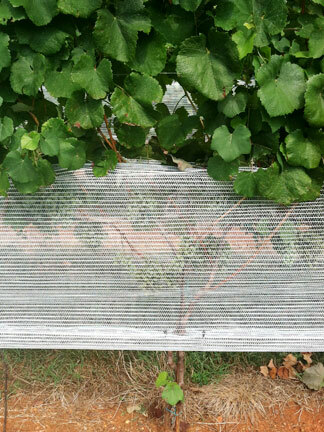 I could see the clusters behind the netting but not very well. 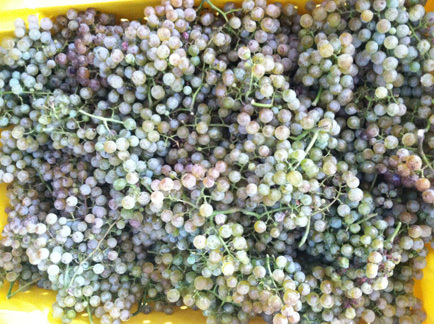 So it was a bit like Christmas when I removed the netting and saw beautiful, clean clusters of Petit Manseng fruit. Rebecca and I harvested the gifts, enjoying the feel of the beautiful clusters in our hands. I left some small little clusters for the mockingbirds. 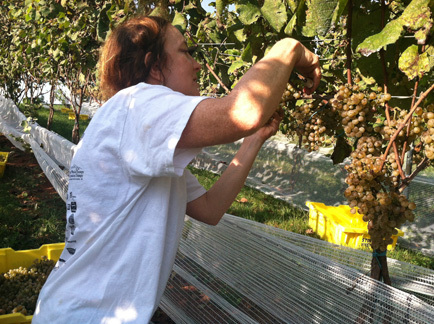 All year they monitored the vineyard, made nests in the vines, and ate lots of insects. It seems fitting that they should have a little fruit, though Scott points out that they have more fruit than they can eat over in the compost pile of pressed grape skins. I still think they may enjoy hopping around in the vines and picking out a berry or two. Each vine yielded nearly 5 pounds of fruit, on two trunks with 4 or 5 shoots to the two canes along the fruiting wire. This is vertical shoot positioning (VSP) on canes. Our amazing vineyard consultant, Lucie Morton, showed us how to prune the vines in March for this French method. Lucie came out several times in the spring to demonstrate how to prune the canopy for the least amount of disease pressure. 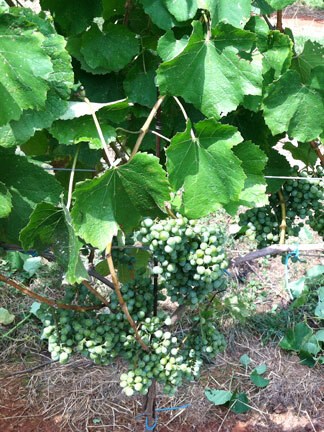 What we are looking for is balance in the vineyard with each vine taking up its space and not its neighbors. Openness in the canopy is important for light and air circulation. Two of our Tasting Room pourers, Sarah C and Sarah T, as well as our family friend Mahaut from France helped me work among the vines this year as we attempted to get closer to the ideal balance among the vines. When the vineyard reflects this balance, it is lovely to behold. It is not a one time endeavor but, like most of life, it requires ongoing focus. Its here! And we’re live tweeting awesome instagram pix of all the action under @stinsonvineyard. 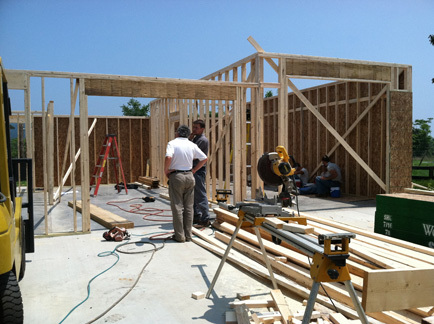 If you missed it, here’s a roundup of the past few weeks. Meeting of the presses. Don’t worry we’ve placed R2D2 at Muse Vineyards for the rest of the season – we know they’ll be good to the little guy! It’s that time of year again.. pre harvest. Our Petit Mansengs have undergone verasion and are starting to ripen, the bird netting is up, winery equipment and supplies are on order. Now all we can do is keep our fingers crossed and hope the weather holds. Some area wineries have already started harvesting for their sparkling wines so we’ll likely see the first of our whites in the next week or so. As if the imminence of an early harvest isn’t terrifying enough, we attended a pre-harvest class with microbe specialist Lisa Van de Water. 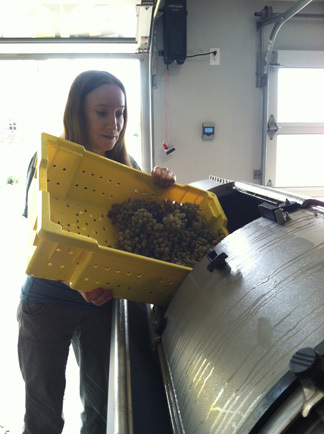 Lisa runs Vinotec Napa, a testing and consultation lab, and refers to herself as “The Bad Wine Lady”. Our vineyard consultant Lucie Morton hosted a group of her clients to brush up on best fermentation and aging practices with Lisa. Many wine spoilers are hard to detect before it’s too late – and difficult harvest conditions can yield lots of undesirables if a winemaker’s not careful. Her number one rule of thumb? “Never trust a microbe”! 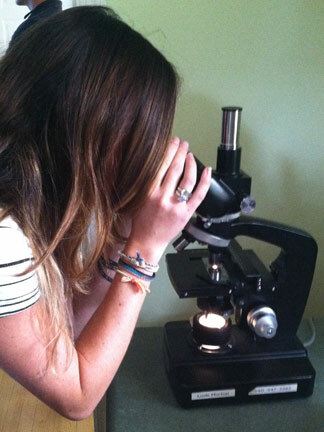 After going over various undesirable yeasts and bacteria, we took a look at a few of Lisa’s slides. 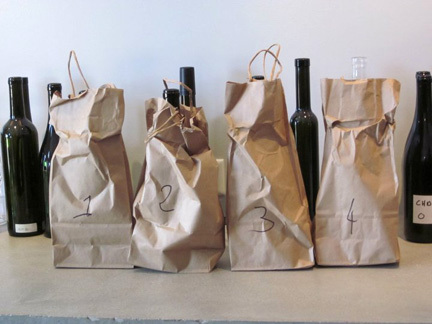 Ok, so we can no longer ignore the fact that wine spoilers exist. Next step? Steaming the entire winery – barrels, tanks, drains, hoses. We want everything as clean as possible before harvest!